This is R2-D2. And this is R2-D2 on meth. 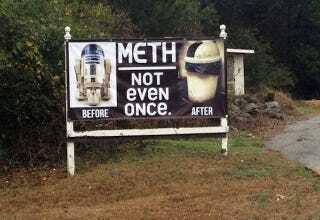 Well played, sign-owning, Star Wars-loving anti-drug activist. Well done indeed. Although it might be worth pointing out that post-meth R2-D2 never maliciously set any of his fellow droids on fire in order to burn them alive.